Let’s face it, the thought of taking your baby on a plane can be utterly terrifying! Whether you’re jetting off on a short haul flight, or you’re facing long hours on a plane with your little one, there’s always a risk they could launch into an epic screaming meltdown. One of the best ways to avoid this potentially stressful scenario, is to try and get baby to sleep on the plane. However, as any parent knows, getting baby to sleep on demand is no easy feat. Travelling with your baby brings so many benefits, so it’s a shame many parents miss out due to the fear of being trapped on a plane with a screaming baby. 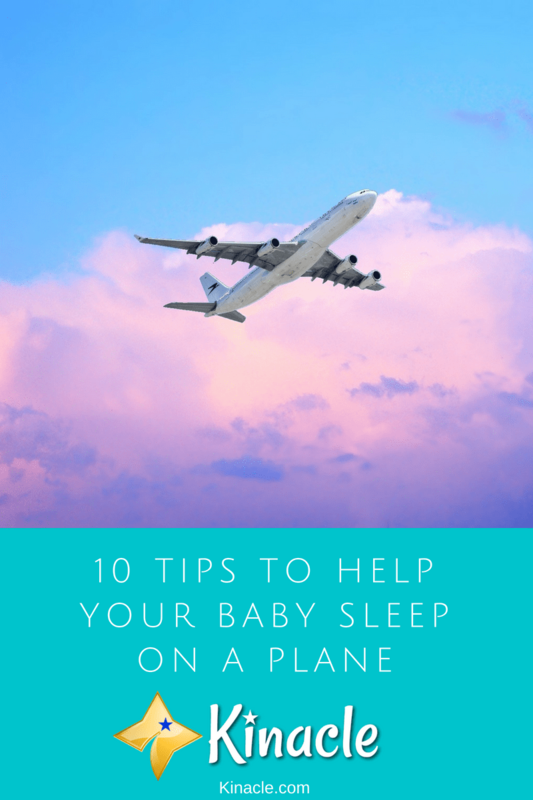 Here, you’ll discover 10 tips to get baby to sleep on a plane to help ease your anxiety and ensure you enjoy travelling with your little one. If you want to really increase the chances of baby sleeping on the plane, flying during the night is recommended. They’ll hopefully have already gotten into a nighttime routine, so getting them to sleep during a night time flight should prove much easier than it would be during the day. Of course, flying at night is also cheaper and there’s often fewer passengers to worry about so it’s often an ideal time to fly for numerous reasons. Bassinet seats are typically offered for long haul flights, though some airlines may provide them on shorter trips too. Bassinet seats enable you to hang a portable bassinet from the walls of the airplane, or they come with a special purpose shelf. The bassinet itself is usually provided, though you will need to check with the airline before booking. It’s important to know that different airlines have their own restrictions on bassinet seats, so you will need to do your research before jetting off. Did you know you can pick up inflatable flying beds for infants? These are ideal if the airline you’re flying with doesn’t have a bassinet seat available. These small inflatable beds are designed to fit onto your knee, helping to keep baby more comfortable throughout the flight. You can use the inflatable bed with or without an airline infant belt, and it’s compact enough to fit in your hand luggage. The bed will encourage baby to nap and they’re really affordable, so you don’t need to worry about having to spend a fortune. Click here to browse travel beds on Amazon! Regardless of what time you’re flying, it’s important to try and keep baby’s routine as normal as possible. Nothing upsets a baby more than disruption to their routine! So, if you are flying at night, try to maintain the routine you’d have at home. Change baby into their pajamas, read to them and feed them as normal. As long as you are calm, and the routine is the same, you should find baby is content with falling asleep. A good tip to encourage baby to sleep, is to feed them when you’re taking off. A full-up baby is a happy one, plus feeding them when you take off will also distract them from the movement and noise of the plane. Before feeding, it’s worth putting baby into a clean diaper and changing their clothing. Once they’ve had a feed, you’ll usually find they’re happy to drift off to sleep for a while. If you’re worried your baby won’t sleep, a pillow spray could be worth trying. Provided your baby is at least six months old, baby-safe pillow sprays can be a useful tool for encouraging sleep. You could even use them at home if you wanted to, provided you follow the guidelines. The scent of the spray works just like essential oils do for adults. It helps to settle your little one and eases them into a natural sleep. The seats you choose on the plane will make a big difference to how easy you find it to get baby to sleep. If you’re stuck halfway down the plane in a center seat, you’re not going to have much space to work with as you’ll have two other passengers at either side of you moving around and taking up space. Ideally, you’ll want to choose a front row seat aisle. These tend to have more space and you’ll also be able to get up and walk around with baby easily if needed. If you can’t get hold of a bassinet seat and you don’t fancy using an inflatable flying bed, a baby sleeping bag could be a good alternative. This is usually just something as simple as a blanket provided by the airline which you can wrap baby up in. However, you can find specialized baby sleeping bags online you could use. The sleeping bag works much in the same way as swaddling, helping to keep baby snug, warm and secure. This really settles baby, encouraging them to sleep. Another tip guaranteed to help baby to settle is to take familiar items with you. This means either their favorite toys and comforter, or something which simply smells like home. If they it feels and smells familiar, they won’t be as anxious about the change in scenery. You don’t need to go mad and take baby’s entire toy collection with you. Just one or two familiar items will do. Finally, the final tip to remember is to not panic if your baby does cry. Even after following all of the tips above, you may find baby wakes up or simply refuses to settle. It’s understandable to be worried about this but remember – the majority of passengers will be sympathetic. Any parent will remember the days of feeling humiliated and frustrated when their baby had a meltdown in public. So, the reaction you’ll get likely isn’t going to be as negative as you think it is. Babies cry, it’s natural. Just do your best to comfort them and remain calm. These 10 tips to get baby to sleep on a plane are guaranteed to help make the flight a lot less stressful. Do you have any tips we haven’t mentioned above? Share them in the comments section below.